Patriot Sanitation Management's owner Ronald Williams established more than 27 years of customer service experience as co-owner of a Green Industry business that still serves central N.C. today. Together with his brother they grew their irrigation business into one of the most reputable in the industry, from a $500 pickup truck to a fleet of 11 trucks. Their success was based on one simple principle..."address the needs of the customer". 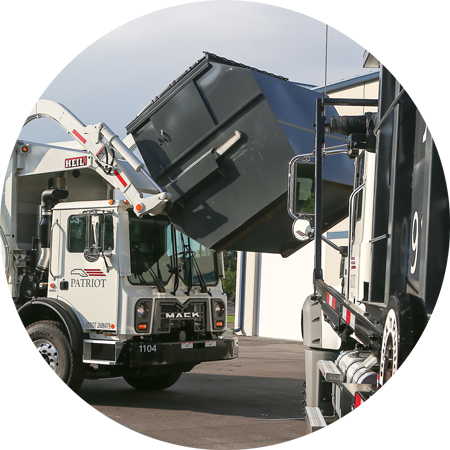 Patriot Sanitation has been in the waste management industry for seven years. During that time, they have served hundreds of companies in North Carolina’s Research Triangle area with an unwavering dedication to customer service. Their Pride is not based upon simply doing their job, but doing it with the utmost attention to detail and courtesies such as always closing corral doors and asking for cars to be removed when necessary. Their Commitment to their customers is further expressed by providing cost adjustments based upon consumer pricing index and no annual contracts (unlike other companies) or hidden taxes or fees. Their Excellence in customer service means they do not rely on call centers, giving you direct customer access with faster response times. Call Patriot, and someone always answers the phone… or responds to your email. They please our customers first, not shareholders. In late 2010, Ronald left the green industry to start Patriot Sanitation Management. With only national waste companies to compete against, Patriot Sanitation Management has not only competed in the market, but has excelled in growth– exceeding expectations from other independent waste companies. He is pleased to say they have never lost a customer based upon their service. Patriot Sanitation Management is no longer handling Residential Garbage Collection. For all residential garbage collection inquiries and needs, call 919-662-7100. At Patriot Sanitation Management, we value relationships. We are confident you will share our philosophy as we redefine what "service" means in the commercial waste removal industry. We are here to serve you, including our management team! Our clients have direct contact with the management at Patriot, not a call center. All of our drivers are commercially licensed and provide a top notch, dependable service, with the utmost respect for our patrons, their property, time, and business. Our commercial waste management services are offered at a consistent, fair rate, with NO annual contracts, and NO hidden fees or taxes. Please Our Customers, Not Our Shareholders. To ensure the trust of Patriot's customers, we adjust rates once annually based on consumer price index standards. We will never increase rates to boost our profit.